Elastigirl: "The creeps have completely taken over the Port, Your Father and Dash are out there training. They’re surrounded! Judy: Nick, you’ve got to help me on this fight club case. I’ve got zero leads! Nick: I gotta find a gerbil who stole a ring from Fru Fru. Have you seen any suspicious gerbils here? Yax: I saw this gerbil holding a diamond ring with a fanny pack. Nick: Yax! That’s our guy. Can you help me find him? Elastigirl: You’re here? How did you know where I live? Sulley: Mike had me drop off some things for him when he was babysitting Jack-Jack. He establishes a new strike force called “Hero Command,” modeled after Star Command. Buzz: Wherever there’s danger, Hero Command is there to take the call. Woody: Hero Roundup will be glad to take care of the situation instead of you. Sulley: Hrm… what about that other big blue guy we’ve seen around? Mike: The Genie? He’d be perfect! You’re a genie-us! Wow, dis timeline must have token u awhile 4 u 2 piece together. Bravo on ur hard work @HeroSSWin. Mike and Sulley’s friendship is trying to restore power to a city through laughter because the city is having a black out. Anyone got anything for this?? Also, may I advise that you look at Merida for more? She r got a lot of friendships and I am gonna start tackling them soon. Not really, the first 2 were made 5 months ago while the last 2… I saved them and decided to put them in the Timeline. I’ll look for others later… I just made the Timeline before I went to sleep. @HeroSSWin you did a great job. Very impressive your rubber band has a lot of snap in it dosent it? In other words your one smart cookie! Keep up the good work! I’ll give you a blue ribbon and a gold star for that! Well kudos to them as well! Oh yah she cannot beleaf that you did this. Hey @HeroSSWin, I think I might have some puzzle pieces to a friendship timeline. In the beginning of the Jessie/Judy friendship, Jessie was gonna go out on patrol with Bullseye. But she dosen’t see him in the stables. And in the Jack/Nick friendship, Nick asks Ralph what Jack did on his crazy night. Ralph said he saw Jack riding Bullseye. I think dis kind of connects. Don’t u think? 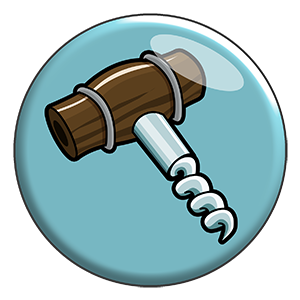 Here’s another potential clue. In the Mr Incredible/Elastigirl campaign, they decide they can do creep patrols as like a weekly thing and have Violet babysit Jack-Jack. Then in the Violet/Jack-Jack campaign she’s babysitting him. 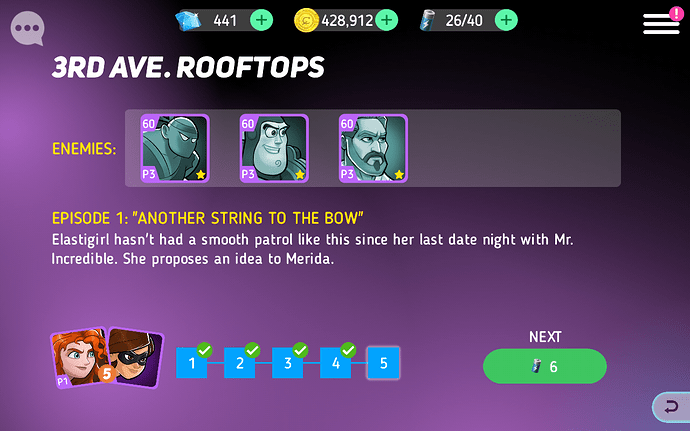 Then in the Bogo/Jack-Jack one I think they specify Violet can’t do it that night, and in the Mike/Jack-Jack one they say “none of” the usual sitters can do it. Hey @Hero_Dante, I think I might have some puzzle pieces to a friendship timeline. Actually, Jesse was with Bullseye in the Covered Market when Jack ran up and jumped on him. Jesse saw the whole thing, so it can’t connect. If you’re working on the Jack/Nick campaign, sorry for the spoilers. Oh. Well then thxs 4 the clear up. Spoiler alert, they go on a date night. Soo this is after that happened…helpful or no? 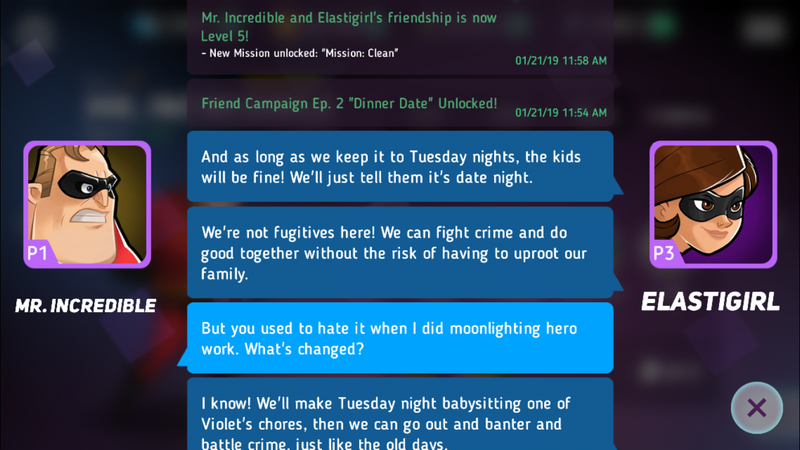 Borrowed this from another post,For some reason I just realized that Date night starts a series of campaigns involving the babysitting of Jack- Jack. Fiirst Violet, then Bogo, Next is Mike.